Thrilled by a performance she sees at a fair, Sonora tries to land a spot as a daredevil who rides horses off of high dives. 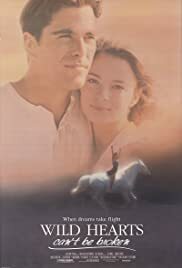 Thrilled by a performance she sees at a fair, Sonora (Gabrielle Anwar) tries to land a spot as a daredevil who rides horses off of high dives. With the help of Al Carver (Michael Schoeffling), whose father runs the show, Sonora works toward her goal. An injury to star rider Marie (Kathleen York) paves her way, and Sonora finds herself on the diving platform. Her life looks complete now that she and Al are in love, but Sonora is about to be thrust into the most trying time of her life. Written by Kacey M.
The inspiring true-life adventure of a courageous young rebel who defied the odds...and won. Sonora: I can do it because I can do anything! I saw this movie when I was in third grade or so, and it was a favorite for a long time. You get gripped quickly by Sonora's stubbornness and determination to become a diving girl. The scenes where she practiced for that used to terrify me, what with all the horses thundering up the ramp and her leaping onto them to dive. The increasing drama of the latter part of the film would probably be too much to take for anyone past 14 or so, but before that age it's a great movie.